Market leading budget coach provider megabus.com has launched a new German language website to make it easier for people in Europe to book its new cross-Channel services between London and Cologne. European passengers who visit www.megabus.com can now access a German language website as well as English, French and Dutch language sites. vehicles. Seen here is a Van Hool used in France. The new German website also trades in Euros, making it even easier for passengers from Europe to grab a bargain coach ticket. Last month, Perth-based Stagecoach Group began operating low-cost coach services from the UK to Germany for the first time. Offering seats for as little as £1* or €1*, the new London to Cologne service, which also serves Ghent and Brussels in Belgium, operates twice a day in each direction, with journey times from nine and a half hours. "We now operate a comprehensive coach network between the UK and Europe, offering people the chance to travel extensively at very affordable prices and we look forward to attracting more and more people on to our greener, smarter coach services." megabus.com launched its European network in April 2012, offering journeys between the UK and Paris, Amsterdam, Brussels and Boulogne. The services have proved very popular with families, students and tourists looking to bag a bargain ticket to Europe. 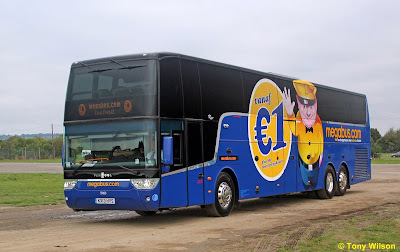 In October 2013, megabus.com announced that it was expanding its network further, by introducing services to Cologne as well as serving Lille, Ghent, Rotterdam and Antwerp for the first time, to provide even more choice for customers travelling around Europe. 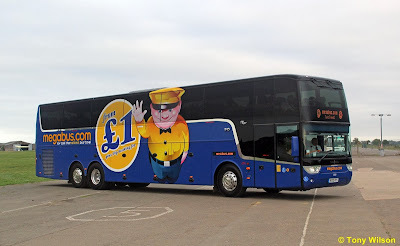 megabus.com recently celebrated its 10th anniversary after launching in the UK in 2003. The company revolutionised coach travel by offering fares from just £1* via a simple online booking system. Almost five million passengers now use megabus.com services in the UK every year, which operate to more than 60 locations across the country. More than 30 million passengers have used megabus.com services over the past decade in the UK. A further 30 million customers have used megabus.com in North America since its launch in the US in 2006. The low fares coach service runs in and out of the heart of major cities, avoiding extra transfers and waiting associated with air travel. Clear low-cost pricing, with no extra fees for luggage or airport taxes, contrasts with budget airlines criticised for pricey add-ons to basic fares. A set of images can be found here by Colin Sellers from a visit at the weekend to the Manchester Museum 'Christmas Cracker' bus event. They show a selection of vintage buses at the museum and on the link that ran to and from the city centre, as well as some of the modern buses on ordinary Sunday service. These will be added to later in the week by others from Martin Arrand.